The Howells began raising Angus cattle well over 25 years ago. Steve and his dad learned quickly that the commercial cattle market appreciated stock that were hardy and relatively good natured. Their experiences at the sale barn taught them that buyers seemed to pay premium prices for calves that were cross-bred to produce white faces, so over the course of years the Howell cattle program has continued to refine breeding practices to maximize the return. Currently, the Howell Ranch commercial herd sire is a registered polled Hereford. This gentle giant produces fine quality offspring that have a history of bringing top prices at sale. This breed is particulary adapt to foraging on native grasses to make the most of available range conditions. This characteristic has been particularly signficant during the drought conditions experienced by all Texas ranchers in recent years. Angus cattle are hardy, disease-resistant, undemanding, easy to herd, adaptable, and mature at 18 months to 2 years of age. 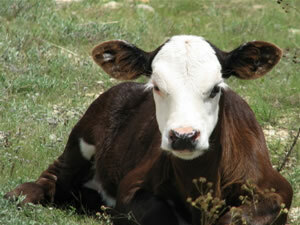 Females are known for producing small calves with ease and have good calf-rearing ability. 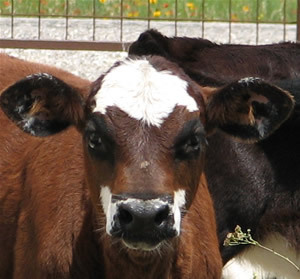 The cross-bred calves are generally thicker and heavier at weaning time. 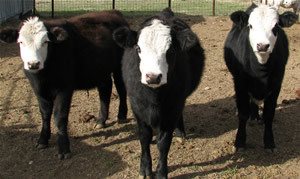 Angus cattle are generally bred as beef cattle rather than as milk producers. The beef is coveted for its high marbling and lean fat content thus producing a higher quality beef product. If you are interested in fine replacement heifers or stocker calves, consider the Howell Ranch operation for your first stop. 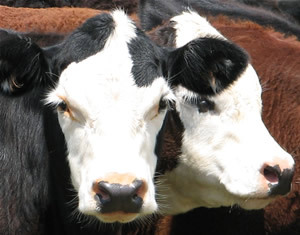 Contact Karol or Steve to learn more about what these fine animals can do for your commercial operation.